Canvas Preparation - Oil Painting from Malcolm Dewey on Vimeo. How To Clean Your Paintbrush: A good paintbrush is something to take care of. Cost aside it is an extension of your creative output. This video shows my basic approach to keeping my brushes clean after a painting session. Once cleaned the brush should be stored bristles-up where it can dry safely. Why isolate shapes? Because it is big shapes that carry impact. Forget details. Here is how to start the process to reduce a complicated scene into its' basic shapes and values. Take a step further with a three value notan drawing. This approach gets you to see the big shapes and three critical values: extreme dark shapes, extreme light shapes and the mid value shapes. This is my usual approach that I use often. A note book, black marker pen and a grey marker pen (wedge shapes tip) is all you need. If you are happy with three value notan and want to try for more shapes in a complicated scene then four value may be helpful. Since most scenes consist of four values this notan goes a long way to helping you isolate the shapes for your painting. You will look for the extreme dark, extreme light and two mid-values eg. foreground and background areas. A summary of the greatest artists of all times. It is fascinating to see how art has developed to this point where there are so many types of art vying for our attention. Has everything been said? Where will art go from here? Art has never been so available to us all yet we cannot take it for granted either. Art appreciation is one of the qualities that makes us human after all. A taste of plein air painting! This time at Mermaid's Pool, East London. Stretching a canvas with your own good quality material and stretcher can be a rewarding experience. It is not that difficult too. This is my method. This Pentel ink pen has ink cartridges and a long brush like nib that makes it great for making notan paintings. I found this one in a craft shop, but it should be available at good stationery shops too. Retails for R130.00, but should last a while if used sparingly for your notan studies. What is a notan study? See the videos on this page to learn all about notan studies. Read the full report on the student oil paint comparison between Winton, Lukas Studio, Zelcol and Maimeri Classico's cadmium reds. Quite a lot actually! 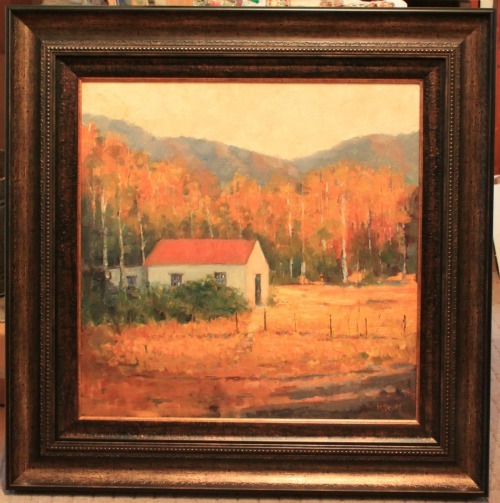 Here is an example of my painting Old Farm before and after framing. Like I say on my Paintings for Sale page - no cheap and skinny frames! That is why I have a framing studio for this important task. I select the mouldings and do the framing myself. It is very satisfying to be personally involved in this process so that I have creative control of how the painting looks. 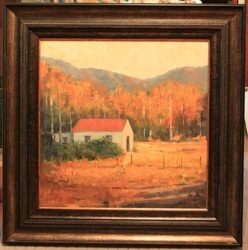 Of course some collectors want to have their own framing done to fit in with their requirements and that is fine too. In the end the frame and the painting should work together to produce a showpiece that will bring you pleasure for many years to come. 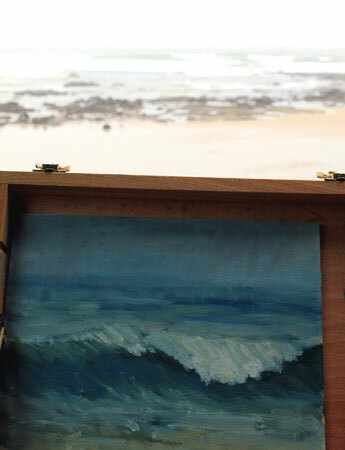 The wind was blowing and rain was following me into the back of my "4-wheel studio" but oil paints still work fine in the (light) rain. 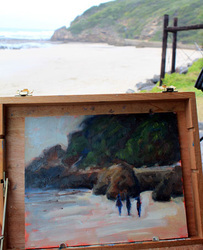 What is interesting about painting in dull weather is the change in light and how this affects your colour mixing. Values are harder to judge, but the soft light makes for excellent atmospheric colours and soft edges. All in all a good way to spend an hour. 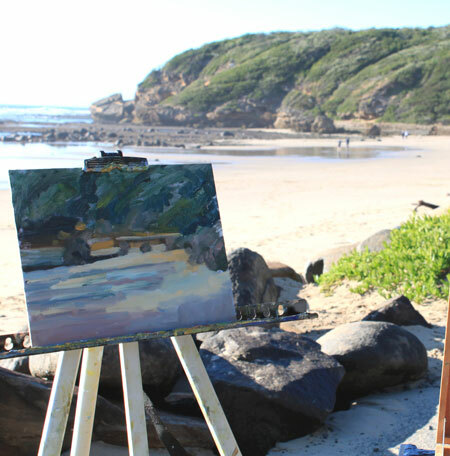 The benefit of this is that I will be able to paint the scenes again in my studio with a keen memory of the atmosphere and experience. This does influence the studio work for the better. Sometimes one just has to get out and paint. I had that feeling recently, but without my plein air kit on hand. 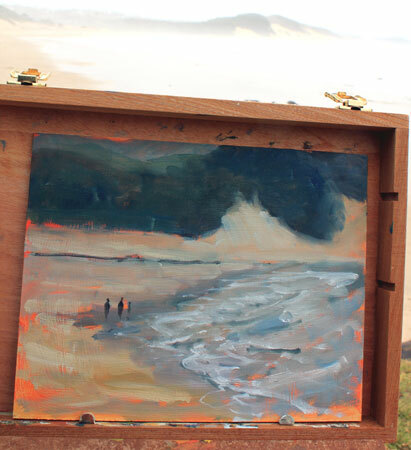 I grabbed my pochade box, some paints and headed off to the beach. 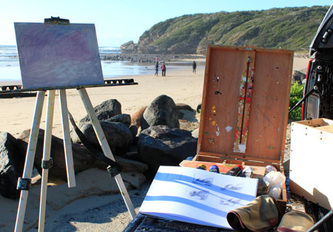 Thing is though - there are a few essentials required when painting on the beach. A hat would have helped and a neutral coloured blanket to sit on would have cut the glare. Too much light reflecting off sand can influence your colour mixing as values tend to get skewed too dark to compensate. Ideally, wind permitting, a good size beach umbrella is just the thing. I still managed to get two studies done, but it was not comfortable. Oh well - it's still better than watching TV! Getting outdoors for a painting session is one of my absolute pleasures. 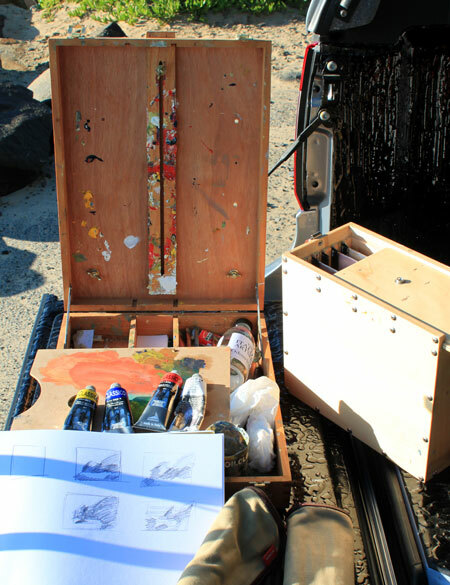 On this occasion I set up my painting kit on my vehicle's tailgate to escape the south-easter wind. 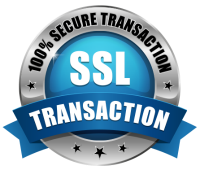 It proved to be a very comfortable solution that I will use more often. As you can see my basic kit is simple and cost effective too. A light weight field easel, limited palette of cad. red light, cad. yellow light, ultramarine and white. I also used a viewfinder to help isolate the scene. This was then drawn quickly into my sketch book as value studies. 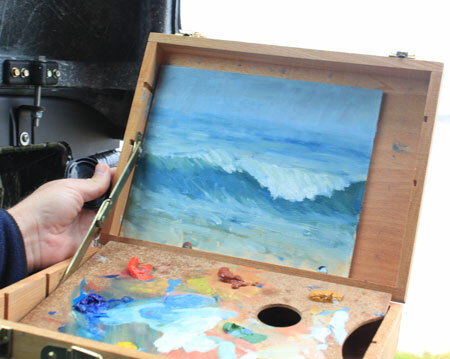 Also note my wet panel carrier box which is essential to get your panels back to the studio undamaged. I have used 20cm x 25cm primed panels. This allows me enough space to get the large shapes and colour notes down without having the pressure of trying to fill a big space. This is part of a series of demonstrations that I will be updating on a regular basis. The demos will highlight important steps that I follow as part of my painting process. I will be using video, pdf files and sometimes both where required. I hope you enjoy this series. Please note that newsletter subscribers will receive more premium content so if you want to join in please register. Techniques for Edges and Brushwork from Malcolm Dewey on Vimeo. 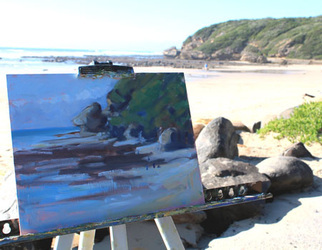 Oil Painting Tips: Traditional Canvases from Malcolm Dewey on Vimeo. 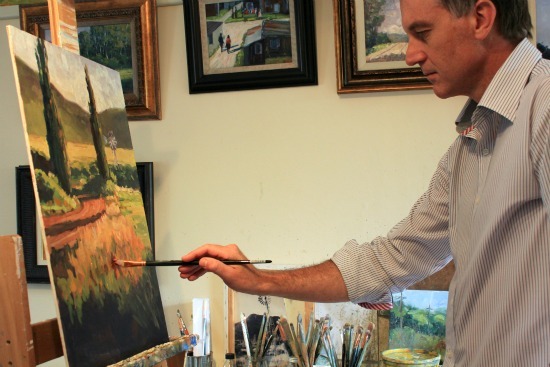 Oil Painting Tips: Priming your Painting Panel from Malcolm Dewey on Vimeo. 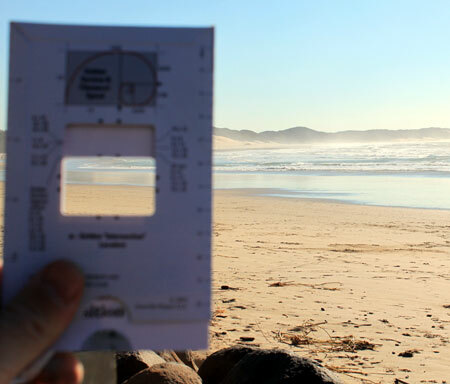 Top Tip: Simplify by Squinting! The Blue Door ready for framing. The completed painting on display. It is always a good idea to get onsite information about a painting that you may want to start. It is especially important to get a strong design in place before you start painting. 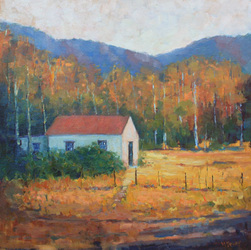 Strong design means good composition and good values - light and dark - that will draw the eye to your painting. 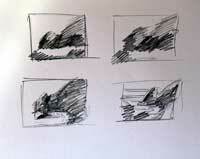 Here are examples of a quick pencil value study and a watercolour study done for the painting Outcrops. Both studies gave me confidence that the design would work and made the actual painting far less problematic because I had dealt with potential design issue in the preparation stage. Value sketch in pencil or charcoal to plot the light and darks. 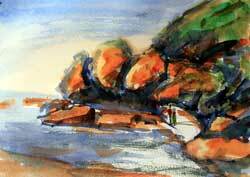 A quick colour study in watercolour on site is helpful to get a good start to the painting. 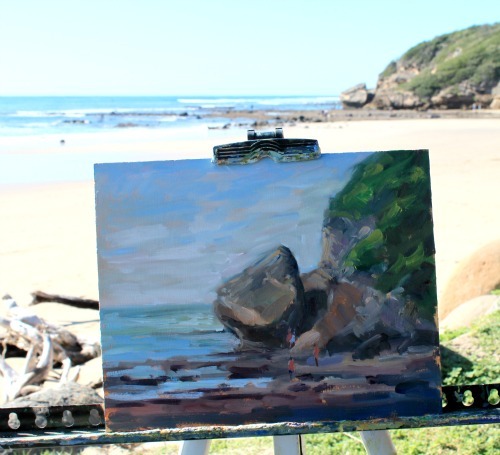 The Colour Isolator:When painting outdoors our eyes naturally merge tones, colours and values. The impressionists knew this and used this to good effect in their broken colour techniques. However to paint colour notes accurately it is necessary to isolate that colour from all the competing colours. Then you can mix the colour accurately and apply it to the canvas. It is also helpful to be able to assess the value of the colour ie. how light or dark is it compared to your lightest, darkest and mid-tone colours. I have used the isolator depicted below to good effect and it can be made easily enough. Try it next time you paint outdoors. This short video shows me getting a quick reference painting in Bathurst. 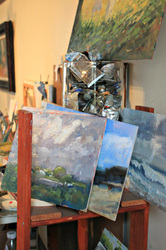 The reference helps me later in the studio when painting a larger work. 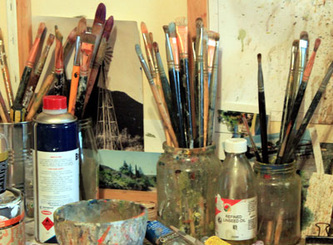 Subscribe to my newsletter: for Studio updates, news, special offers!